North Slope trail is an easy to hike one mile trail through the coastal hills of northern California. Sweeping view of Lake Sonoma and the surrounding wine country are common along this trail. With gentle slopes, any park visitor will find this trail enjoyable. Location: Located at Lake Sonoma Recreation Area off of Rock Pile road in Sonoma County, California. On highway 101 take the Dry Creek Road Exit in Healdsburg. Travel west on dry creek road for 12 miles until you reach the “No Name” parking lot on your left. Hike ¼ mile on No Name Trail until you reach the start of North Slope. North Slope trail is nationally significant in its unique location in the heart of Sonoma County's wine county. This location allows visitors to appreciate not only the world class wines and the natural landscape the area is known for, but also to better understand how sun, soil and water all effect the vegetation that can be found in this unique biome. The trail is a short looping trail that is part of a larger chain of interlocking loops designed to allow casual day hikes as well as more advanced overnight back county trips. North Slope was designed to meet ADA guidelines but its appeal is universal and is one of the most heavily used trails in the park. Its gentle slopes ensure that it moves through the landscape in a natural meandering fashion and its 4 foot width allow casual strollers to walk side by side making this a unique experience for couples. 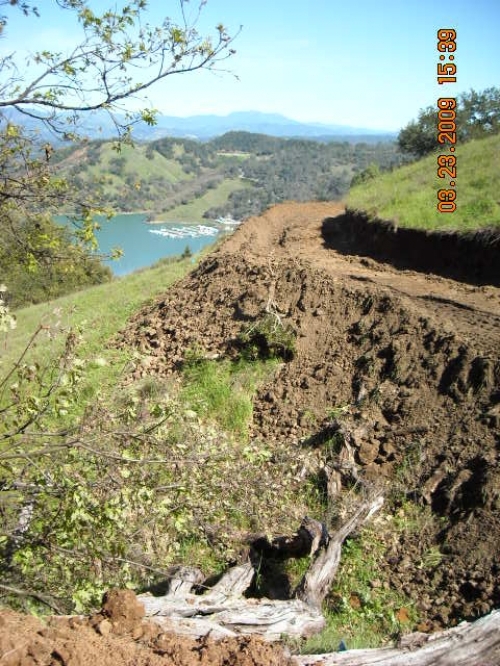 The design and construction of North Slope trail was a unique partnership between the U.S. Army Corps of Engineer, the Northern California Chapter of the Back County Horsemen, nonprofit organizations including the Friends of Lake Sonoma and park volunteers. All of these groups came together to provide design work, hands on muscle and financial support to build this trail. Simple design features like properly out sloped trail surfaces and no engineered wood structures combined with the trails popularity ensure that little maintenance is required on this trail. The compaction the trail receives through regular use ensures that surface vegetation stays in check. The fact that the trail was built by local volunteers has also instilled a sense of ownership where regular hikers handle all the pruning of bushes and trees along the edge of the trail. North Slope is used by a wide variety of park visitors. In the summer, wine tasters go to the trail head to enjoy locally produced wine, (park rangers have it on good authority that this trail pairs best with a cabernet sauvignon). In the fall and winter, the trail is used by bow hunters as a way to access our active pig hunting grounds. In the spring, wild flowers can be found in abundance along the trail and provide a pleasant background for hikers, bikers, and horseback riders.